Probably the most charismatic figure of all the italian prog scene, Antonio Bartoccetti (Antonius Rex) began his career going to Milan from the Marche, forming Jacula, Dietro Noi Deserto (even with a single on Decca in 1971! ), and Invisible Force (another lonely single in 1971). Not real bands but just a group of musicians working beyond the leading figures of Bartoccetti and Doris Norton (aka Fiamma Dallo Spirito). Their first album, in 1969, was recorded in London and only released in a strictly limited number of copies (300 + 10 promos) that were only partly distributed by the producer and label owner to sects. An album full of dark atmospheres, mainly based on guitar and church organ and with no drums. In 1971 two singles were released under different names: first as Invisible Force, with two tracks that later reappeared in Tardo pede in magiam versus and Zora; the B-side 1999 mundi finis, later re-released as U.F.D.E.M. and Morte al potere is one of their classics. The second single that year appeared under the name of Dietro Noi Deserto, this time Bartoccetti was the bass player and composer of both tracks; this seems to be the only proper group which he has played with, and the style is closer to late 60's psychy beat than progressive. Second album, and usually considered their first proper release, was Tardo pede in magiam versus, also released in limited number of copies for an unknown label (this seems to be a constant in all the Bartoccetti production) and housed in a cover sporting the same design as the previous one, but coloured instead of the original black and white. The medium Franz Parthenzy is also listed in the line-up along with the three official members Antonio Bartoccetti, Fiamma Dallo Spirito and Charles Tiring. Long instrumental spectral organ parts are the main ingredient of this album, that has in the suggestive U.F.D.E.M. (also on the Invisbile Force single) probably their best track. Dark atmospheres abound and some tracks, like the spoken (in bad english)Long black magic night can be boring for many listeners. 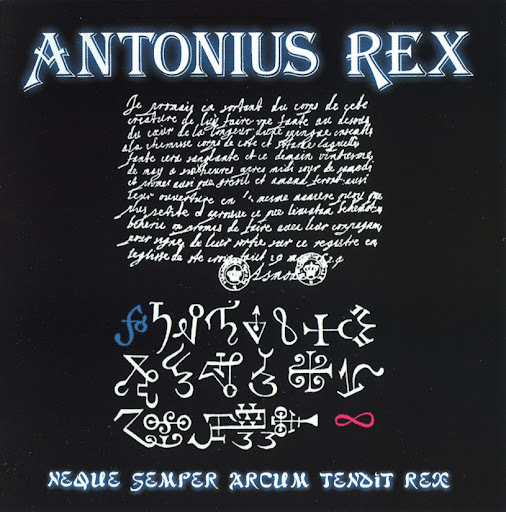 In 1974 a new name change to Antonius Rex and an album called Neque semper arcum tendit rex. Despite a contact to release it on Vertigo, the label considered it to be too outrageous, with the black and white cover reproducing a 17th century "diabolic" letter and strong lyrics, especially in the Devil letter track. The album was planned for release on drummer Albert Goodman's Darkness label, but it never went over a promo issue. So the first real commercially released Antonius Rex album is Zora from 1977, on the small Tickle label and, again, with an outrageous cover that was replaced with a different one a year later. Zora is not a great album, despite its collectibility, and includes some reworkings of tracks from Jacula's Tardo pede in magiam versus (Morte al potere is a third revised version of U.F.D.E.M. ); their main elements are as usual church organ, dark atmospheres, lyrics dealing with occultism. The four tracks on the album were all composed by Bartoccetti along with Franco Mussita and Angelo "India" Serighelli from I Raminghi, both also listed among the LP contributors. The second issue includes an extra fifth track. Ralefun is definitely much less dark than anything else they made, more varied and the sound is richer with the addition of flute and bass guitar (with guest appearences by Marco Ratti and Hugo Heredia), but some ventures into different music styles don't always work very well. Very mysterious characters, Jacula/Antonius Rex never liked concerts, their only live appearance ever as Jacula has been made in Milan in front of a 45 people audience while Antonius Rex apparently had a tour in 1979, and have always liked to do what they wanted, without the record companies restrictions and obligations. In 2005 the first Antonius Rex official video has been released, Magic ritual. A new album called Switch on dark should be out in Summer/Autumn 2006.